In my little studio space is at a premium. I have just about everything on wheels so I can move them about. 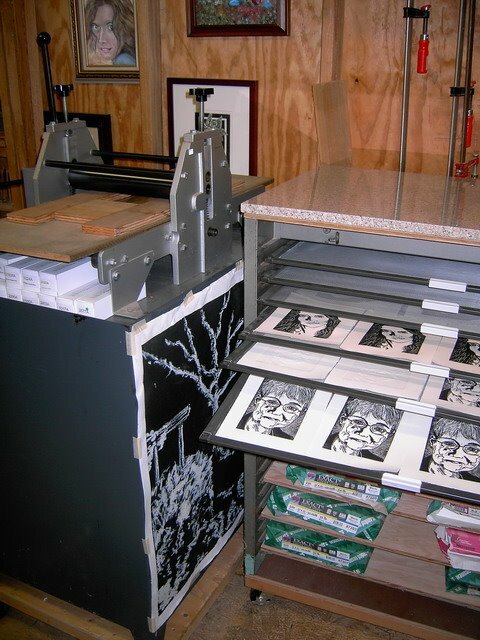 But having things on wheels didn’t save space when it came to drying prints. I would either have the prints covering every available horizontal surface or hanging from a clothes line I had stretched inside the studio. Neither was a very elegant solution. Then I visited the studio belonging to a member of our local printmaking group, and I stole her idea. I went to Home Depot and bought the materials for making window screens from scratch and made a number of screens sized to fit an empty cabinet. I had never made or repaired a window screen before, so I wasn’t sure I would be able to do it. Fortunately the only tools required were a hacksaw and a spline tool that I bought with the screening material. And while the screens are not all prefect, they are more than good enough for my needs. Now my prints they are out of the way, and I can work on other projects while they are drying. There isn’t a bad time to visit Yosemite, but early April has to be one of the best times. 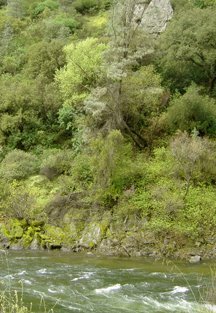 Highway 140 from Merced to Yosemite runs along the Merced River. 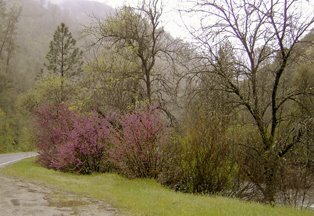 As you approach the valley, it is lined with purple lupine and California Red Bud trees in glorious bloom. The weather is changable, so what is Springtime, shirt-sleeve weather one day can be followed by a snow storm the next. 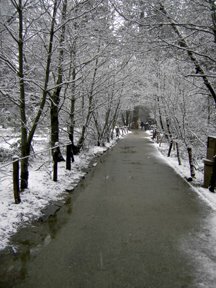 But if you are prepared for snow, you can have the entire valley practically to yourselves. This is in the center of Curry Village. It can make you feel you are at Disneyland rather than in a national park because of the crowds, but when it snows, even Curry Village is practically empty. 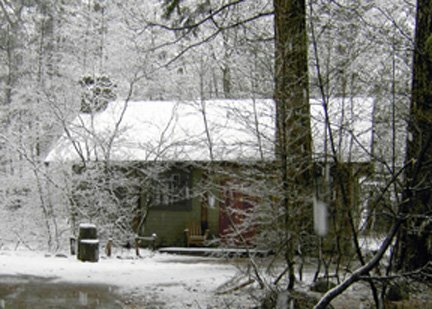 The best accommodation in Curry Village, and possibly in all of Yosemite, is Cabin 819. When my wife and I were young and poor, we spent our honeymoon in a tent cabin with twin beds, no heat, and a bathroom down the lane. For our thirty-fifth anniversary we stayed in Cabin 819. Not only does it have a bathroom, it also has central heating, a king-sized bed in the bedroom, and a living room with a fireplace big enough to roast a pig; and if you think you might ever get bored, bring your DVDs because there are flat screen televisions and DVD players in both the living room and the bedroom. When we made reservations, we didn’t know about Cabin 819. We just took what was available. Glorious!